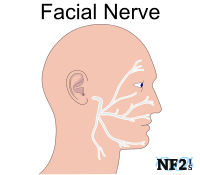 CN8: The functions of cranial nerve 8 (CN8/vestibulocochlear nerve) is responsible for the function of its nerve branches the cochlear nerve (hearing), and vestibular nerve (balance). 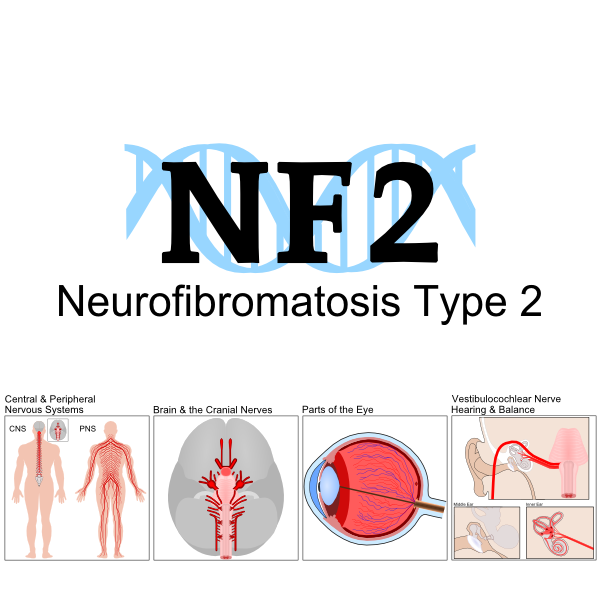 While neurofibromatosis type 2 (NF2) results in eye issues as well as the potential growth of meningioma and ependymoma, the primary tumor growth type typical for the NF2 condition is a schwannoma. 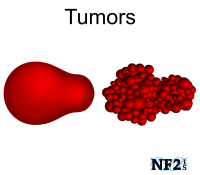 Schwannoma tumors are an overgrowth of schwann cells. Schwann cells are a part of nerves that aid in communication of either senses or impulse for movement of the body. 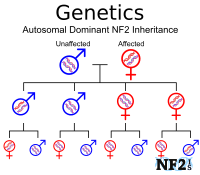 The hallmark tumors of the genetic condition of NF2 are schwannoma tumors alone CN8 and CN7. 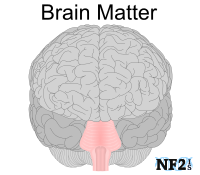 Individuals with NF2 may also grow schwannoma on other nerves, the growth of these masses can result in damage that would be either muscular or sensory in function. 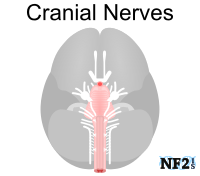 Other locations NF2 schwannoma might grow in the brain include cranial nerve 3 (CN3/oculomotor nerve), cranial nerve 4 (CN4/trochlear nerve), cranial nerve 5 (CN5/trigeminal nerve), cranial nerve 6 (CN6/abducens nerve), cranial nerve 9 (CN9/glossopharyngeal nerve), cranial nerve 10 (CN10/vagal nerve), cranial nerve 11 (CN11/spinal accessory nerve), and cranial nerve 12 (CN12/hypoglossal nerve). Overgrowth of schwann cell(s) inside of the nerve cells Myelin of a Nerve Cell, will result in fewer breaking points between Myelin for Node of Ranvier, each missing Node will mean less strength of Action Potential to carry sensory information along with a nerve. 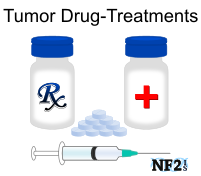 When a Schwann Cell overgrows and transitions to become a Schwannoma if it is threatening other nerves, is surgically removed, or radiosurgery is used to stop the tumor, the nerve the Schwann grew on will no longer function. If a schwannoma grows slowly enough, the mass can reach a considerable size before it results in complete loss of the nerve. 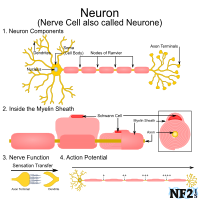 The purpose of the schwann cell on the neuron is to control impulse signals along the axons. 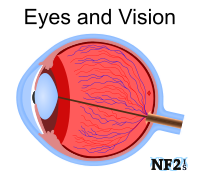 Depending on what the purpose of the nerve would determine if the information was sensory or muscular. 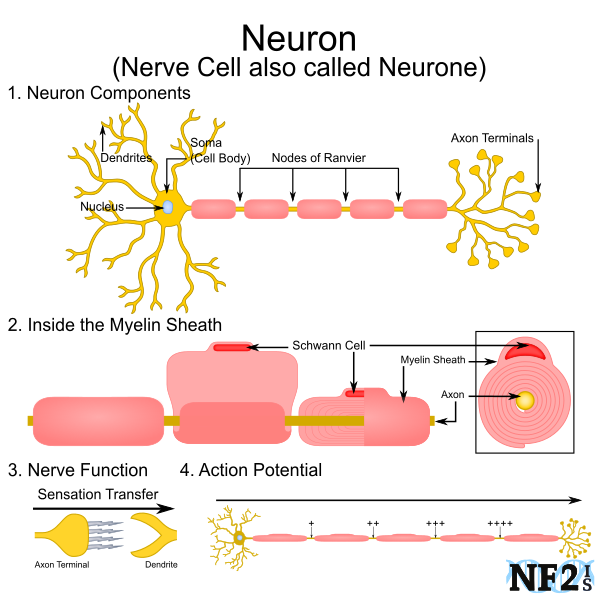 To understand why and how Schwann Cell Damage can occur, it is best to understand the parts of a nerve cell and action potential. Neuron: A neuron (nerve cell/neurone/neurolemma, is an electrically excitable cell that processes and transmits information through electrical and chemical signals. Nucleus: The nucleus of a neuron is the same as the nucleus for any other cell type; it contains the cells genetic material. Axon: The axon (nerve fiber), is a long, slender projection of a neuron, its job is to conduct electrical impulses away from the neuron's cell body to transmit information to other cells. Glial Cells: Glial cells (neuroglia/glia), are non-neuronal cells that maintain homeostasis, form myelin, and provide support and protection for neurons in the brain and peripheral nervous system. Axon Terminals: Axon terminals (synaptic boutons), are distal terminations of the branches of an axon. An axon nerve fiber is a long, slender projection of a nerve cell, or neuron, that conducts electrical impulses, called Action Potentials away from the neuron's cell body, or soma, to transmit those impulses to other neurons. Dendrites: Dendrites are the branched projections of a neuron that act to propagate the electrochemical stimulation received from other neural cells to the cell body, or soma, of the neuron from which the dendrites project. Myelin: Myelin is a fatty white substance that surrounds the axon of nerve cells, forming an electrically insulating layer. It is essential for the proper functioning of the nervous system. It is an outgrowth of a type of the glial cells. Myelin Sheath: The myelin sheath is myelin wrapped around the axon. A myelin sheath is a many-layered coating, largely composed of a fatty substance called myelin that wraps around the axon of a neuron and very efficiently insulates it. Nodes of Ranvier: The nodes of ranvier (myelin sheath gaps, are the gaps (approximately 1 micrometer in length) formed between the myelin sheaths generated by different cells. At the nodes of ranvier, the axonal membrane is uninsulated by a myelin sheath and therefore capable of generating electrical activity. Action Potential (AP): For a signal to travel along the axon of a nerve cell, a charge must build up across the axonal membrane. This spike in voltage is what is termed an Action Potential (AP). Creation of APs must be repeated many times at structures along the axon known as axon gates. However, with myelin sheaths insulating the axon, an AP is observed to "jump" to the next ion gate which occurs at a neighboring Ranvier node. Thus, in myelinated axons, action potentials can "hop" along the axon, by which process the signal travels faster by skipping around the insulated sections. Deora, Harsh. "Rare cranial nerve schwannomas: A retrospective review of nontrigeminal, nonvestibular cranial nerve schwannomas." Journal of Neurosciences in Rural Practice 9.2 (2018): 258. "Glossary." (Retrieved October 2018) Linus Pauling Institute. Oregon State University. Elsevier Health Sciences. "Introduction to the Peripheral Nervous System."